Hi and Congratulations! I am pleased to announce that your submission for my "Webmaster Award of Excellence" has been approved. 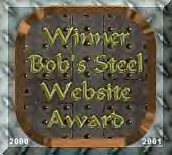 Your site was reviewed against the criteria and you have won the Webmaster Silver Award!! Job well done! :o) Ray "TinyRay" Grier. Greetings from Greece, after a careful review of your site, we are delighted to award you with the boombastic award silver. You have really done a great job there. Again congratulations and keep up the great job. We wish you happiness, health and more success in the future. Chris Salas and team.